Based in Central Florida, Companions for Courage is a 501(c)(3) non-profit organization consisting of volunteer teams comprising of a handler and a special Therapy Animal that are there to “help make the sad things seem not so bad”. The volunteers and their animals help to give courage to child victims of abuse by escorting them into the courtroom where the Companion sits with the child in the witness box. If the child becomes nervous or uncomfortable, they can pat their Companion or rub them with their feet. Sometimes it’s hard to speak to a room full of strangers, so they can look at their Companion, as long as the people in the courtroom can hear them speak. Companions for Courage animals have been evaluated and been labeled as being “bomb proof”, meaning they do not react to loud noises, sudden movement, or other distractions. Their focus is to be a Companion, or best friend for their child, and nothing else. We have other animals that can assist children in counseling sessions at the Children’s Advocacy Center. The Companions for Courage animals help to relax the children that come into the Center and have to talk about things they would rather not talk about. The Companions for Courage animals are the best secret keepers and the children know that their secret will not go any further than the walls of the room or the ears of their Companion. Our teams are also available to sit in during depositions with the child. This is another place where the Companions help these children to relax. Our handlers sign a confidentiality agreement to ensure all statements remain confidential. Companions for Courage is an all-volunteer organization, and as such, all of our services are provided free of charge. "Helping to make the sad things not so bad"
"Helping to make the sad things not so bad" Did you ever wonder where our tagline comes from? It came from a letter from one of the very first children that our founder, Woolf, helped. 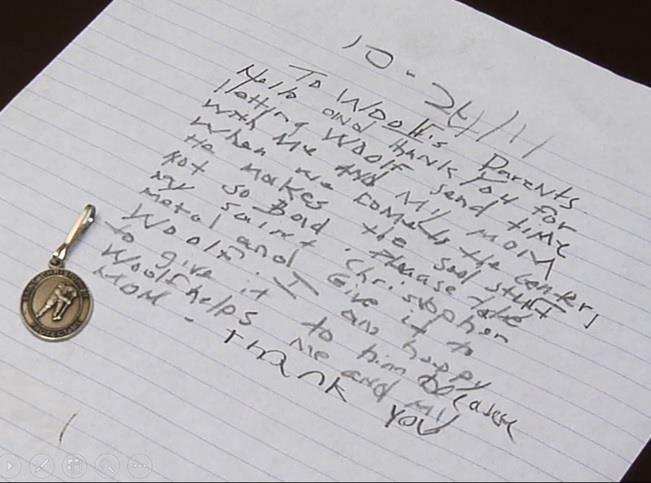 In the letter, the child thanks Woolf and gives him his St Christopher medal. This was the beginning of Companions for Courage. The K9th Circuit Program was established under the direction of Judge Thomas Turner (Retired). Judge Turner saw the need for children to feel a sense of security while undergoing forensic interviews or testifying in court. The dogs may also be used for adult victims of violent offenses, those who are mentally or emotionally challenged, or whenever the court needs to take a more therapeutic approach. The Ninth Circuit is the first Florida circuit to utilize both pet therapy dog teams and a professionally trained, ADA certified dog and its handler. All pet therapy dogs and their owners must be TDI certified members of Companions for Courage, currently the only provider approved to work in the Ninth Circuit. Laura Brimmer served the Ninth Judicial Circuit court for over three decades, and most of her career focused on developing and improving court processes - primarily in the Juvenile and Family Courts Division where she served as the Court Operations Manager for over twelve years. Laura received various commendations from the Chief Judges of the Ninth Circuit for her dedication to help solve problems and her stellar customer service including the nickname of “Ms. Fix-it.” As a founding member of the 1997 Teen Court Advisory Board, she was instrumental in the development of Orange County Teen Court which continues to be one of the top Teen Courts in the Nation. In 2008 Laura was appointed Staff Director for the Orange County Juvenile Commission. In 2014, Laura developed and implemented the K9th Circuit Court Program, to aid children in the dependency courts as well as adult victims of violent crimes. After being convinced that Companions for Courage met her own high standards as well as those required by the Courts, she convinced us to expand our services to the Ninth Circuit. Laura now serves as voluntary court advisor to our organization and she delights in promoting the use of court therapy dog teams throughout the State of Florida and beyond. We gratefully thank the Mount Dora Community Trust for generously helping to fund the publication of our Companion Photo Album. When children testify with the "Companion" they themselves have chosen from the album, they will feel empowered...not alone and helpless throughout their judicial journey. The generosity of the Mount Dora Community Trust has made it possible for the vast distribution of these books to Lake County School counselors, Mount Dora Christian Academy counselors, Lake County Courthouse prosecutors and child advocates...all who are first to reach a child victim. Christy Borgstedte of CLB Photography has been the photographer for Companions for Courage since our very beginning. She has had a lifelong passion for photography, and while she's done all types of work, from weddings to family portraits, pet photography is her love. And it shows in her work!